Every year, about 50,000 women walk into an IVF clinic in the UK, hoping it will help them achieve their dream of parenthood. But despite almost 40 years of research, the treatment fails 70% of the time. 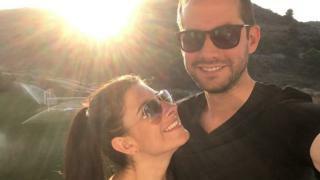 The BBC's Sophie Sulehria shares her struggle of trying for a baby. I didn't think it could happen to us. We had been married for six months and had no reason to think we couldn't have children. All our friends had become pregnant so easily, it should have been the next step. But four years of IVF treatment and £38,000 later, our baby dream feels further away. Jonny and I met in 2009 and two years later, we were married. We bought our first house together which we were going to renovate ourselves, excited to earmark the spare room as the nursery. We'd always wanted children, from the moment we met we talked about it. I didn't have a thought in my head it would be hard for us. But of course, it was. By the end of 2013 I was pulling my hair out. Although people warned me it could take time, I knew something was seriously wrong. I had always had acute tummy pain but was repeatedly told by doctors it was "probably IBS". But when I didn't fall pregnant, I started to join up the dots. A laparoscopy confirmed it was far worse than we had feared - I had stage four endometriosis, a condition where tissue that behaves like the lining of the womb is found in other parts of the body. It was suffocating my reproductive organs and had started to grow on my diaphragm, kidneys and liver. It was that day we were told it would probably be impossible to have children naturally. I remember Jonny collapsing into a chair, unable to take in the news. Blood tests also revealed I was suffering from premature ovarian failure. I was in my early 30s and had the egg count of a 50-year-old. We needed to move quickly if we wanted to try IVF with my own eggs, so we started treatment on the NHS in April 2014. Even after a huge amount of medication, they were only able to collect one egg, though it was "top quality". As I waited the two weeks until I was able to do the pregnancy test, I was certain it had worked. Sadly I was wrong and we were forced to face doing the whole thing again. But this time we would have to pay privately. Time was of the essence as with every month that passed by, my egg reserve got lower and lower. Three more years of hell ensued - six rounds of unsuccessful IVF, at a total cost of £38,000. We had to borrow money from family and with each failed round, the news has got worse and worse. How could this be happening to us? I hit complete depression. My body didn't feel like my own and my phobia for needles was getting worse, yet every day I had to face up to five of them. But the hardest part of it all was my mind, I was all-consumed with being a mum. People would only have to mention their baby news and I would have a meltdown. Everywhere I turned, people would be pregnant. The worst year was 2016. Some days I couldn't get out of bed, just staring into space thinking how far away the dream of being a mum felt. But it was Jonny I felt for more. Not only did he have to face the fact he may not be a dad any time soon, but he also had to live with me. This wasn't the woman he married - a low, depressive person who couldn't have his children. When I first heard the words "you won't be able to have children naturally", it hit me like a wrecking ball. Since that day my positivity and determination to build a family with the woman I love so dearly has rarely wavered, but when it does, it feels like overwhelming waves of raw emotion with no end in sight. People have said what a great support I have been to Sophie and what a rock I am. The reality is, my weaknesses are often hidden, covered by a brave face. I always wish I could do more, I wish I could fix this, make everything OK. The reality of how I've coped with the journey is simple - Sophie. She is the only reason I have been able to, and still can, get up every morning. I will continue to do everything I can for her and our future family, however that comes. Sophie and I used to talk about our life together, building a family, home and future filled with love and joy. I know this can all still happen, just in a different way than we envisaged, and more than ever we are determined to make that happen. I had no idea about the 70% IVF failure rate until we became one of the statistics. We are now nearing the end of our fourth year of our fertility journey and I can't remember what life was like before we started trying for children. But if we want a family, we may need to start looking at other ways to do so. So what do people do when "baby plan A" starts to move further and further away? What other options are out there for us to become parents? What does "plan B" look like? We have no idea. Do we look at adoption? Fostering? Using donor eggs? We don't have a solution, we don't have a baby, and we don't know what to do next. Over the next few months we will be exploring our options as part of the PM series on BBC Radio 4. It wasn't an easy decision for us to make, to bare our souls to millions of people. However, if it helps one other man, woman or couple start to face the next step in their journey to have a family, then it is worth it. Sophie Sulehria will be sharing her story and exploring her options as part of a three-month series on PM on BBC Radio 4.